Homegrown in Gettysburg, PA, GettysGear® is a proud supporter of all the local businesses under the Great Gettysburg Addresses® banner! If you are visiting Gettysburg, be sure to stop by and see them at the downtown location located at 28 N. Stratton St. or give call at 717-334-3747. 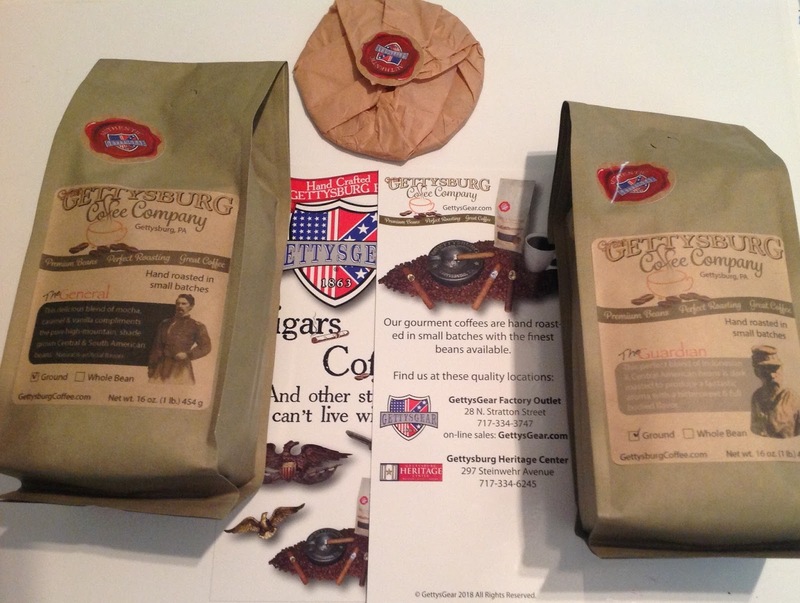 Great Gettysburg Coffee Company™ procures the finest high mountain, shade-grown beans possible. The beans for this blend originate from Central and South America. They are locally hand roasted in small batches and then packaged to ensure the freshest and most aromatic cup of coffee you can imagine. All of their coffees are packed in high quality, foil lined bags that are heat sealed with a one-way valve to ensure freshness. Each bag also has a resealable tape to help maintain freshness while you are enjoying your coffee. These bags are a full 16 ounces (1 lb.) of coffee rather than the more common 12 ounce bags that you might find elsewhere. Available in drip grind. Their drip grind is compatible with reusable, refillable K-cup filters. Cassandra's Review- I noticed the fragrance as soon as I opened the package because it was so strong and beautiful. It is the kind of coffee that can bring out a little tear in your eye as it brews and you feel the warmth, smell the goodness and most importantly taste the high quality yum factor. If you love coffee or have someone special in mind that does, this is going to be a truly pleasant gift. I would really enjoy this in the cooler months and possibly as an iced drink in the hotter days ahead.